Variations on Keynotes slide layouts. Is there a better alternative to Speech Pack? Is Speech Pack really the best app in Presentation Tools category? Will Speech Pack work good on macOS 10.13.4? Speech Pack…Give a fresh look to your Keynote presentations! Speech Pack includes 10 stylish variations on a smartly-structured layout of Keynote slides, which give you vast freedom to turn your presentation into a winner. 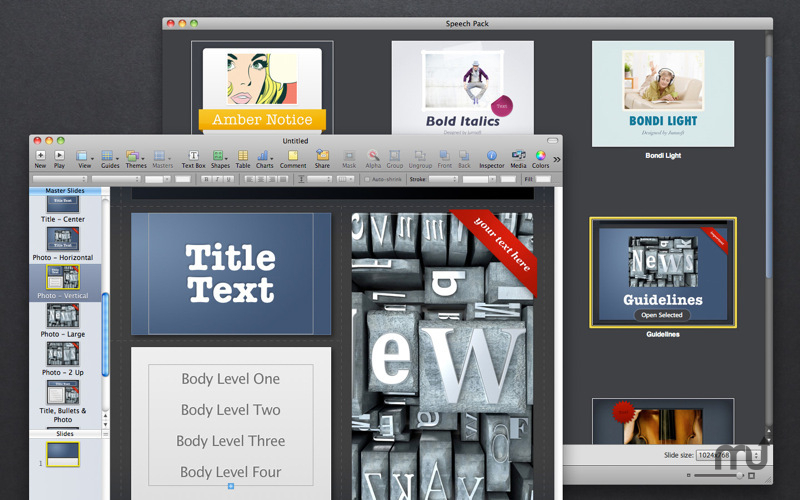 Each of the 10 themes includes 14 modern and polished master slides - a mix of bullet text and photo-oriented layouts. All photo slides feature media placeholders to crop a placed image neatly into a custom shape. All themes included in Speech Pack are available in the five most popular sizes: 800 x 600, 1024 x 768, 1280 x 720, 1680 x 1050, and 1920 x 1080 pixels. Speech Pack needs a review. Be the first to review this app and get the discussion started! Speech Pack needs a rating. Be the first to rate this app and get the discussion started! Most objects in the themes can be effortlessly recolored, reshaped, moved, or removed. You can change the background to a color, gradient, or photo with a simple modification in Slide Inspector > Appearance. Type or paste your own text, add and remove text boxes, and change the font if you wish. Drag your photos or pictures onto slides to replace the stock images. Make sure that nothing stands between you and your top presentation.